Erosion, an installation by Michel Comte at his show in Beijing, consists of 500 porcelain pieces to show the color changes of glaciers. A century ago, Michel Comte's grandfather crossed the Alps and returned with stunning images of shining glaciers with white snow covering the mountain ranges. However, while following in his grandfather's footsteps, Comte found the glaciers to be more of a dull gray and much smaller than those photographed by his predecessor. At his new exhibition, Light III, which opens on Friday at Beijing's Galerie Urs Meile, the Swiss-born artist uses installations and paintings to show the change in color of glacial landscapes in recent years. It's a "quite wake-up call" and a reminder of both the environmental impact of climate change and the resulting decline in glaciers across the world, says the 64-year-old artist. "It's unbelievable that the snow is not white, but more gray, brown and even black," laments Comte, who is perhaps best known for his filmmaking and fashion photography rather than any environmental activism. However, for the past 30 years, Comte, who is also a climber and aviator, has visited glaciers across the world, climbing mountains to film them or taking photos of them from helicopters. Last year alone, he claims to have visited 30 glaciers, one of which, on a mountain in Norway, he recounts, was melting with gray and black water flowing down it. The rapid decline of the world's glaciers has driven Comte to employ his creativity and use his art to communicate to people just how bad the situation really is. 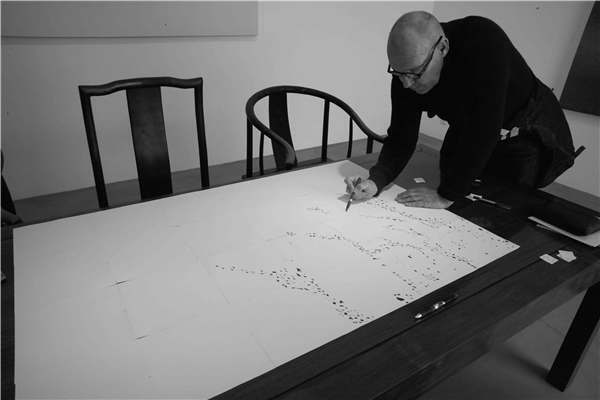 Artist Michel Comte works on his monochrome painting Salt and Dust in Beijing. "Contemporary art is a good way of communication," he explains. "I'm not an activist. I just offer visual art to remind people of what is happening." The highlight of his Beijing show is Erosion, a large wall-mounted installation consisting of 500 porcelain tiles produced in Jingdezhen in Jiangxi province, a city widely regarded to be the Chinese "capital of porcelain." The tiles are arranged by Comte to form a 30-meter long strip, with the colors gradually changing from different shades of white to gray to black. The mixture of sand, salt and pigments in porcelain production generates a texture similar to glaciers. He says climate change caused by carbon output is a global issue. "Since there are not enough glaciers melting into the sea, oceans are getting saltier and corals are dying," explains Comte, while musing on the consequences of the glacial plight. He hopes his work can inspire people to shift their eyes from phones to nature, to experience firsthand how the environment is changing. "China is making a gradual change to protect its environment. I see lots of people planting trees in many areas," Comte observes. "For generations, they have planted trees to make a desert into a forest." Although the decline of the glaciers vexes Comte, he remains positive about the future. 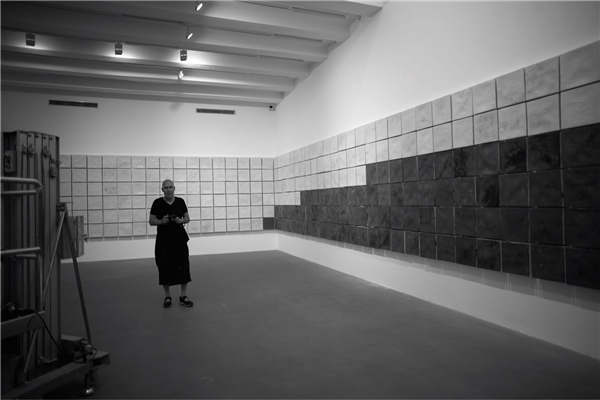 His other installation, comprising pieces of rice paper carrying the imprints of individual porcelain tiles, shows a wall of white, which Comte envisions is the snow and glaciers returning to a healthy state. "If we take action from now, there will be positive changes," he concludes.